NBA2K gives you several play types that you can assign to your players. To help you make sense of these play type options, I compiled a list of each of the different play types available. I also included a short description of what those type of plays do and in some of the play types included a video example of a play so you can see what one looks like in action. In all of the videos, the play is ran against the cpu or versus a user on hall of fame difficulty, simulation sliders. Isolation An isolation play is where you give the ball to one player and everyone gets out of the way to play his man one on one. There are no passes and no screens. In the video, I call an isolation play for David West which turns into an easy bucket for George. Not your typical isolation play but a good result from that playbook. Pick and roll The pick and roll is one of the most common plays in basketball. An off ball player comes up and sets a screen on the ball handler's defender. The ball hander runs his man off the screen and the screener rolls to the basket to receive the pass. Here's a good example of me running a pick and roll play with George Hill passing to Roy Hibbert for an easy layup. Pick and fade mid The pick and fade mid is set up just like the pick and roll with one difference, the roll man fades to an open midrange spot to take an easy jumper. In this video, I run a pick and fade to David West for a jumper. He wasn't as open as he could have been but he knocked down the shot nonetheless. Pick and fade 3 point The pick and fade 3 pointer is where the screening man has three point range. After he sets the screen, he fades out all the way to the three point line instead of the mid range area. Ideally, you'd use a big like Chris Bosh, Kevin Love or Dirk Nowitzki to fade out to the three point line. Bigs like those guys are hard covers for bigs like Roy Hibbert and they really stretch the defense. Pick and roll option The fourth pick and roll play type is the pick and roll option. Instead of the pick and roll being set in the play, the play will respond to how the defense is playing and choose either roll, or fade. Post up low Post up low play types are great for bigs with the ability to do moves that start with their back to the basket down on the low block. If you've got a big with good post moves, you'll want to feed the post and let him dominate inside. Here's a nice low post play I ran for Roy Hibbert that took a little while to develop but got him a nice shot. Post up high If you've got a big who can shoot the 15 to 20 foot jump shot and who's a good passer, then you've got an opportunity to work out of the high post. The high post is the area up by the free throw line. One of my favorite players who worked the high post was David West. He was pretty much money from 15 to 17 feet. Here is a play I used to get Scola open in the high post for an easy jumper. Guard post up There's a special set of play types exclusively for guards who like to post up like bigs. Typically, these are stronger guards that have a size mismatch and decide to take their guy down in the low post. One of my favorite guard post up players was Mark Jackson. In fact, because of him (and Charles Barkley) they added the five second back down rule. But another good guard post up player was Andre Miller. Cutter Cutter plays are an under utilized set of plays in the playbook. The idea behind a cutter play is to get a guy cutting to the basket behind the defense. Often cutter plays end up with the player the cutter play was called for ending up right underneath that basket for a high quality shot. Here's an example of a cutter play that got me a great dunk with Paul George. Mid range Mid range plays get your players shots outside the paint but inside the three point area. You'll often have guys that can shoot good from mid range but aren't so great from three. Those guys are prime candidates for mid range plays. Here's a simple play I ran for Paul George to get him an easy 15 footer. 3 point 3 point plays get your guys an open look from the three point line. They are just like the mid range plays, except they are designed to get your shooters open from behind three point arc. In this video, I use a simple play to get Orlando Johnson a wide open look from behind the 3 point line which he knocks down. 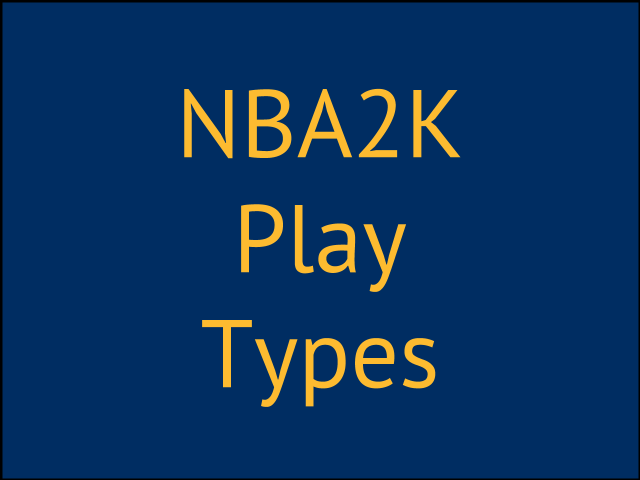 That's a summary of the NBA2K play types you can choose from in the game. If you decide to work on getting your players better looks with plays, assigning them the proper play types is the first step. The next step is take a closer look at all of the plays within that play type which I'll focus on in a different article.